Black History Fact: How Slave Owners Edited The Bible For Enslaved People To Stop Them From Seeking Their Freedom.. Reader I feel all kinds of ways about this. The liberating power of the Gospel of Christ was so powerful that Slave Owners resorted to butchering the Holy Writ so the slaves would not get any idea about a God of the margins. 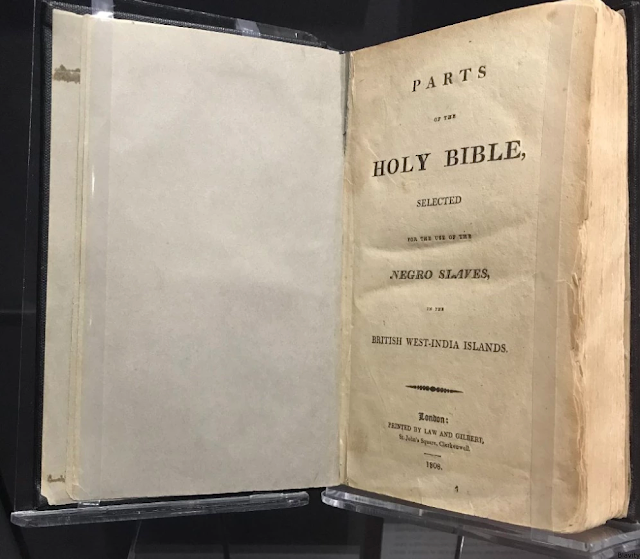 This volume of the Bible was called "Holy," but it was deeply manipulative. Based on the King James Version, it omits all entries that express themes of freedom. The story of Exodus, for example, describing the Israelites' escape from slavery in Egypt, is missing. The editors left out entire books and large portions of others; their selections stressed obedience, submission, and acceptance. The book was part of an inhumane process to make slaves docile and subservient, to break their spirits. Think about how lowdown this is. It was already illegal for an enslaved person to read, but even if they could and they hid it, the Bible they may have gotten, which was supposed to nurture them spiritually, had all parts that spoke of freedom removed. And what about free people of color?!? This is a perfect example of how systemic oppression operates and is yet another reason why so many folks are against organized religion.